Independent renowned developer Introversion continues to plug away at the alpha for its massive strategy sim Prison Architect, releasing updates on approximately a monthly basis. This feature takes an in-depth look at each new update to describe what it entails and how the new features affect the overall game. If you want to be a part of the alpha and have some input on the game’s development trajectory, visit Introversion’s website to purchase alpha access. The arrival of Alpha 10 is heralded by several impressive new features as well as a wealth of improvements both under the hood and aurally. First of all, Linux is now supported! 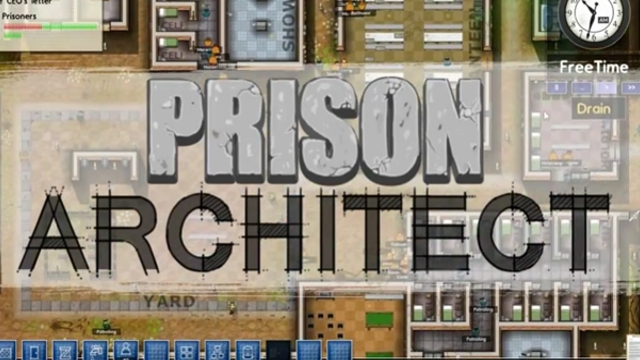 If you’re a Linux user using Ubuntu 12.04 or later, you’ll be able to enjoy Prison Architect. Wider compatibility is planned for later. On top of now supporting that OS, Introversion has been hard at work putting together some highly-anticipated features and improvements to the game’s already robust set of gameplay elements. The first of these is the ability to post your prison on the Steam Workshop, the client’s user-driven original content hub, for the world to see. Any of the prisons on the Workshop can be subscribed to, downloaded, and played. Some of the prisons already on the Workshop are extremely cool; some users have taken to making bizarre shapes and designs out of their prisons, while others attempt to maximize space and resources for a prison that is 100% efficient. It’s great fun to upload other players’ prisons to observe, watch how they achieve things that may have been difficult with one’s own prison, or to try to improve with tweaks. A more sadistic player would see how quickly they could send things into chaos. Conveniently, the Workshop is accessible from the game’s menu, launching the list of prisons in the Steam browser window. From there, you can simply subscribe to a prison, adding it to the list of prisons in the Workshop list in the menu and load it up at any time. If the author of the prison updates his creation, it will update automatically. The anger model for the prisoners has been entirely revamped, and now a prison-wide “thermometer,” working behind the scenes, represents the anger level of the prison. Unsavory conditions will slowly cause the danger level (“heat”) of the prison to rise collectively. When that level gets too high, a riot will break out, and rioting prisoners will capture an area of the cell block, attacking guards, causing damage and freeing other prisoners before moving elsewhere. These are quite scary, particularly when it means watching carefully-laid plans and the prison itself fall into chaos. Some of these riots are extremely hard to contain, as well. Each prisoner has his own “boiling point,” or the level at which he will snap and start to act out. As the danger level of the prison continues to rise and hits the boiling point of each prisoner, that prisoner will start to misbehave. This is not specifically shown in the HUD, but each prisoner’s rap sheet will assist in knowing how dangerous he is. A prisoner with a 50-year sentence for assault will have a much lower boiling point than a prisoner with a 3-year sentence for a nonviolent crime, who won’t lose his temper for quite a while. It’s best to make sure prisoner needs are met. This is a challenging feat—the number of angry prisoners can quickly snowball, and things will be out of control if prisoners are neglected. It can also be deeply rewarding—happy prisoners are efficient and obedient, bringing ample revenue to the facility. There’s a sense of peace to watching a prison that’s running correctly. Lead Designer Chris Delay promises the future connotations for the “thermometer,” specifically how the necessity for cell searches must be balanced against the danger of doing so. Searching cells is necessary for keeping the prison safe, but will cause a spike in the heat level when conducted. Most importantly, this will eventually grant true freedom in running a prison with an iron fist or with a gentler hand. In addition to the background thermometer, there is a new information panel at the top of the screen that gives detailed information on the overall danger level of the prison. This panel will state the danger level of the prison, whether it’s increasing or decreasing, and—most importantly—the factors that contribute to the fluctuation. This latter feature might be one of my favorites of Alpha 10, as it gives a detailed breakdown of what is affecting the overall danger level of the prison. For example, it will state something like “23 prisoners have serious complaints,” which is increasing the danger level (a long-standing feature places a thought bubble above each prisoner indicating what his specific complaint is), while something like “13 prisoners say they are well-treated” indicates that the danger level is decreasing. Putting abrasive prisoners into solitary confinement or enacting other punishments acts as a deterrent, which will make others less likely to react violently when upset. One of the biggest ways to make your prisoners angry as well as incapacitate the unruly ones is to use riot squads. A long-requested/hinted feature, riot police are dispatched to the prison during a particularly bad riot, using aggressive and violent force to detain or dispatch prisoners. This can be a good way to keep riots under control, but they can also further incite the prisoners and lead to more problems. Also added to the emergency services are paramedics, which can be called in manually (like the riot squads and fire department) to patch up some of the more serious injuries sustained during a fight. Knowing when to call these services in is made easier with the inclusion of incident markers, which alert you to offscreen incidents with a marker on the edge of the screen in the direction of the dispute. Previously, problems would arise with no feedback, which could allow things to escalate without any sort of warning. Now, the marker will direct you to the incident so you can respond accordingly. It’s a small update with surprisingly noticeable repercussions. What of those sound updates? Alpha 10 introduces a massive amount of brand-new audio that significantly enrich the game experience. Audio cues leading up a riot include booing or banging objects against the wall, indicating a threat. Once a full-on riot breaks out, the roaring crowd is accompanied by a dramatic music score, which increases in intensity alongside the riot. The effect is has on the overall intensity of these gameplay segments is literally astonishing, and it’s now hard to imagine the game without Alistair Lindsay’s impressive work. Finally, there are a couple of new tweaks to general unit selection and control, which improve them and make them a lot easier to work with in terms of dictating paths for units to follow. The older system was by no means clunky, but it didn’t always work quite as expected and feels much more elegant now. Additionally, laundry must be ironed before it is distributed and prisoners will change when they need to. That’s it for Alpha 10. There’s a focus on prisoner anger and well-being with this update, and should make managing, interpreting, and responding to the complaints of the prisoners a bit more convenient and streamlined. As always, it’s another bunch of micromanagement for the prison, which is always a good thing for a game that is this deep (and that continues to get deeper). It’s not too late to join the Alpha and have a say in what comes later. The base pack is $30, a value that continues to get better with each update. If I haven’t convinced you yet, check back next month for what Alpha 11 brings.